Kitchen! Kitchen! 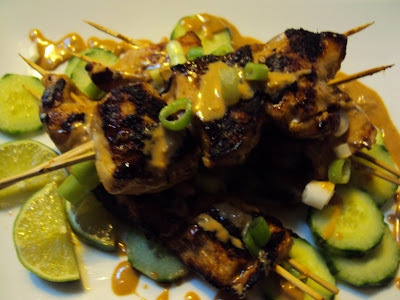 : Chicken - skewer - peanut sauce.........at kitchen! kitchen! Chicken - skewer - peanut sauce.........at kitchen! kitchen! Combine in a bowl and mix thoroughly - add cilantro or green onions before serving. In a bowl, mix the marinade paste; add 2 tablespoons soy sauce; 3 tablespoons oyster sauce; 2-3 tablespoons olive oil. Add and coat the chicken breast cut in cubed pieces to the bowl and allow to marinate for 1/2 hour or so. Use 2 skewers and carefully, skewer 3 to 4 pieces of the chicken; coat the pieces with the marinade and set aside. On a very hot oiled grill pan lay the skewered chicken as flat as you can and allow to cook for 5 minutes or so on each side until its cooked. (Try not to overcook the chicken please).